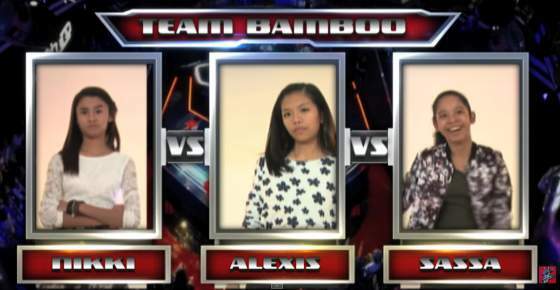 VIDEO: Sassa defeats Nikki and Alexis in The Voice Kids Philippines Battle Rounds - Balita Boss! Camp Kawayan young aspiring singers Nikki Apolinar, Alexis Prieto and Sassa Dagdag sang "Hold On" by Wilson Phillips on The Voice Kids Philippines Season 2 Battle Round, Sunday, August 2, 2015. Coach Sarah and Coach Lea picked Sassa. Coach Bamboo also chose Sassa, 12-year-old 'Singer from Pampanga,' as the winner in the three-way battle. She will advance to the next round of the competition – the Sing-Offs. The Voice Kids of the Philippines is a Filipino reality television singing competition. It is based on the reality singing competition The Voice of Holland, which was originally created by Dutch television producer John de Mol as part of The Voice franchise. The show is hosted by Luis Manzano, Robi Domingo and Filipina pop-rock singer-songwriter Yeng Constantino. Sarah Geronimo, Bamboo Mañalac, and Lea Salonga serve as the three coaches and the judging panel of the show. Watch The Voice Kids Philippines Season 2 every Saturday 6:45 p.m. and every Sunday 7:00 p.m.